This simple, easy-to-use device puts the oxygen cylinder where it's best for the patient and the EMT---on the cot side rail rather than underneath the cot or between the patient's legs. 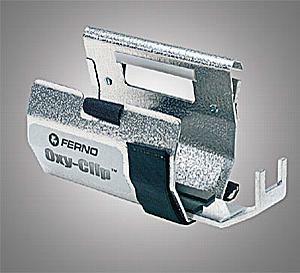 The Ferno Oxy-Clip securely holds either steel or aluminum D size cylinders. Spring-loaded latch enables the Oxy-Clip to instantly attach to the cot rail, eliminating delays in the preparation of the patient for transport. Spring-loaded latch enables instant, one-step attachment of oxygen cylinder to the sidearm. Easy access to regulator controls allows EMTs to constantly monitor oxygen consumption.